Today I would like to talk about blogs that have a unique design for each post. 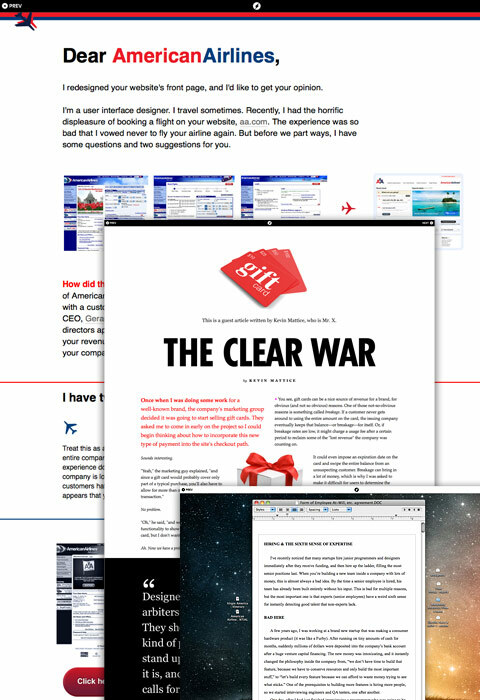 They break the traditional blog layout by designing a different theme for each post based on the topic. 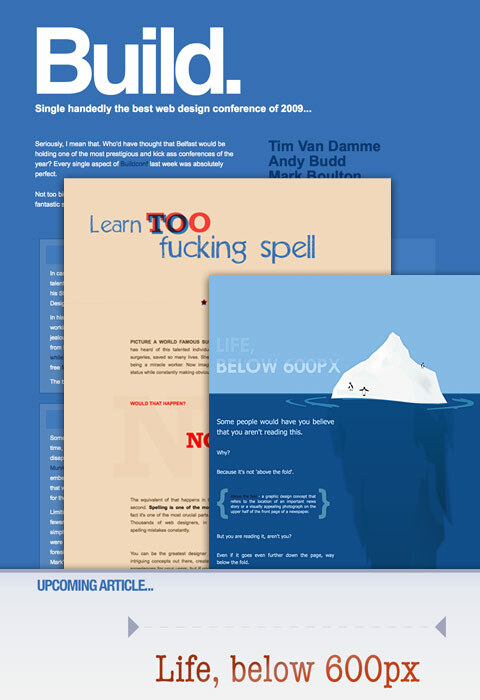 Designing a different layout for each topic requires a lot of time and creativity. So, we should appreciate these blogazines who spend their extra time to make your reading more pleasurable. If you would like to join this unique post trend, below are some excellent examples and WordPress tips on how to implement it. Every post on 72ave is well planned and designed — from color theme to layout to typography. Truely amazing work! Dustin shows a table of content on his landing page. For each post, there is a different theme that goes with the topic. The interesting feature about Paddy’s blog is he gives hint about the next topic at the end of each post. Beside the unique blog posts, I’m particularly impressed by the scrolling timeline navigation located at the top. If you worry about site branding and consistency, here is a good example to solve this problem. David DeSandro plays around with the content and comment area, but the header and footer remain the same. Trent Walton made it so easy to manage his blog posts by keeping the header and footer black which goes well with any light color theme. 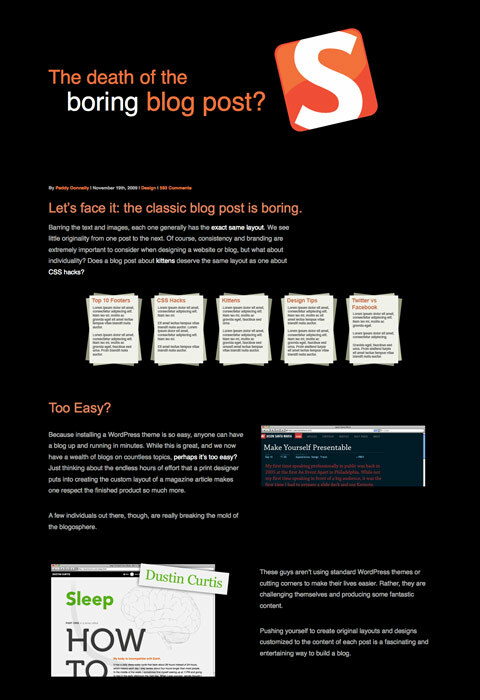 What make this blog stands out are the background images, color theme, and typesetting. Is unique blog post design taking too much of your time? Try to do it occasionally or on a special post like Smashing Magazine and Designer Informer. Creating custom post layout with WordPress is relatively easy. I find the easiest way is to design the blog posts on your local computer and then call the custom stylesheets with the WordPress’s custom field feature. On your local computer, first create a folder (eg. drafts) to store your blog posts. Duplicate a copy of your theme’s style.css file in the draft folder. For every blog post, create a new folder (eg. custom-post-title). For each post, create a new HTML file for writing and a new CSS file for custom layout where you override the theme’s style.css. When you are done with the draft and the post design, upload the custom stylesheet to your server. In the backend, create a custom field (eg. custom-style) where you input the path of the custom CSS file. Now in your theme header.php file, add the following code after the main style.css. i really love this site. you’ll post some really good articles. thanks for the posts. Great collection of unique post blogs. I’m trying the same thing out on my blog http://www.acwe.co.uk and I think it makes for a much more interesting site. I’ve gone for keeping the header and footer the same too as it really keeps the site looking like one entity despite the different styles of pages. Definitely a huge design step forward for the humble blog and, as a newspaper and magazine designer by day, it’s great to see websites getting inspiration from other more traditional media. Some really nice examples here – the furthest we went was to make big images for each blog post! This method is easier than creating a new theme for each post. Using an HTML file is good for checking the appearance, but not for writing your post. There are other tools for that, including BlogDesk, Windows LiveWriter and even a text editor. I’ve always wanted to do some posts like this but I figured I posted too frequently to give it a try. Then I saw the posts on Design Informer and Smashing Magazine and it may be time to throw my hat into the ring. Thanks for the wordpress tips too! Great post, I wish I had time to spend on my own blog rather than building other people’s :) I need to go over it, though, I have plans. Wow, those are some really attractive posts. I never knew it was somewhat easy to create custom posts like that. I’ll have to give it a try because I feel like my posts are plain and maybe boring. This is a great way to spice up your blog. I just feel that a few of the examples are just a tad too unique per post. Sites of Jason Santa Maria, Trent Walton and Jack Cheng, for example, do it best. Their posts are unique, but you never feel like you’re on a different website. There is consistent navigation and logo as well as a coherent brand throughout. Some of the examples are super creative, but I feel a little lost from post to post. The ThemePerPost plugin makes it easy to have different themes for one or more pages on WordPress blogs. Thanks for sharing these, they’re so cool. I especially love the 72ave one. I, however, do not have the patience to make a different layout for each post, but it is such a cool effect if you do take the time. I bet you each of their visitors are curious for what each new blog post layout will look like so they probably have a higher pages per visit than other blogs do. Great post. I truly believe that this is the way the web should be going. If there is anyone out there saying that this is just a trend I would say that the same could be said about designing in templates. How is designing an article a trend, isn’t that what we designers do…? BTW I am pretty insulted that my site isn’t up there :p http://www.yaronschoen.com never-the-less great post!! While I think some of these are great (Paddy Donnelly & Trent Walton), I feel that some are a little hard to follow. After a while clicking through each page I just got tired of doing so. I felt like I was going to a different website on each click. It also feels these are designed only for other designers to appreciate. The average web user might get thrown off. Props on the work but don’t go overboard. 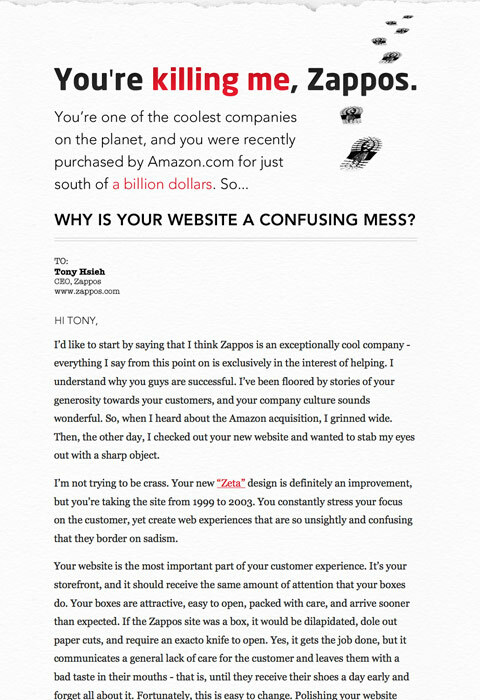 Actually found it ironic that one of the quotes said “Why is your website a confusing mess?”. Thats how I felt about a lot of these. For me, what makes a good blog post is the content, not the pretty pictures around it. This is a brilliant way to spice up your blog and keep your readers constantly coming back to see what changes will be made per post. 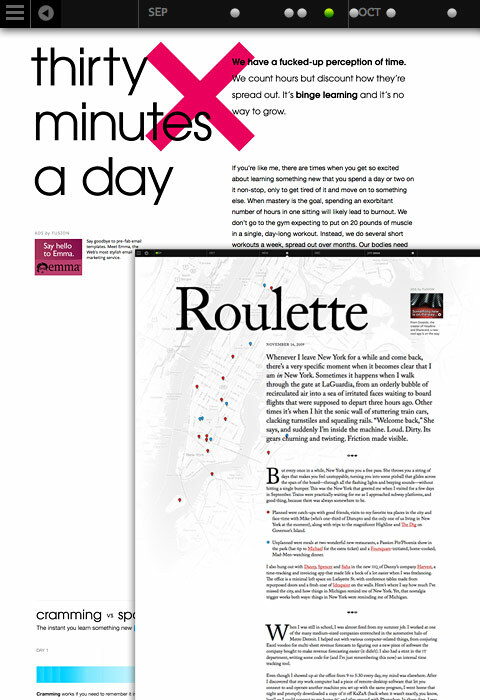 Making these unified also add a unique element to the design and layout for ease of reading. By having a common theme between each post, however, allows the reader to know they are on the same website, and not continuously jumping around from page to page. As Paddy does, it is a smart idea to slightly hint to the readers what the next article will be like, to entice readers and make them anxious for the next post to come! Another site utilizing the custom designed blog post is http://www.terrafirmaclothing.com What’s different here is it’s actually a company that has started doing it, not just a personal/design blog. I’ve recently been experimenting with this concept on my blog at http://www.zombiepriests.com . 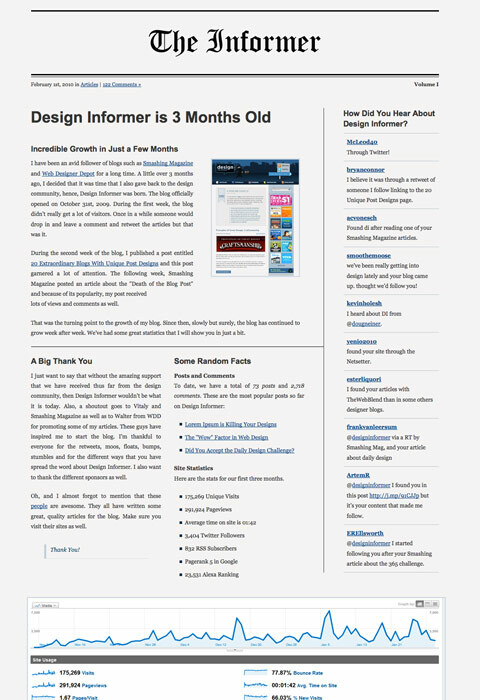 It gives me a regular design challenge while still keeping within the framework of a basically simple blog format. Amazing examples. Are these just as easy to do in Blogger? 3. How do they look on mobile devices? I’ll check tonight, but I’d guess they don’t transfer too well. More and more consumptions happens on the go – any examples of making the design translate to mobile in such a beautiful fashion? Again – love them all design-wise. Just curious on ease for standard bloggers and functionality for the reader. I just love how every post is a statement in itself and has its own theme to enhance the posts content. Thanks for sharing. Reminds me of a great quote, “Some people weave burlap into the fabric of our lives, and some weave gold thread. Both contribute to make the whole picture beautiful and unique.” (unknown author). BTW, your site design is beautiful and unique as well. It is always great to have a unique look and feel to your blog. Adds to the brand! That is a great idea. I have looked into that before and found a plugin that allows you to create a post template instead of the usual page template in WordPress. The solution you provided would be great too. The only thing I would worry about is keeping a consistent brand throughout your website. I wouldn’t want frequent visitors to be confused as to what website they are on. Maybe a few consistent features to identify your brand. I absolutely hate websites that change their whole appearance at almost each click. Sorry. I really do. It is super confusing, disturbs my peaceful surfing experience and makes me want to leave the site immediately. There’s no way I could ever get accustomed to it. @Ginchen Then you must really hate magazines. You can use the WordPress Theme Thesis that allows you to use a different CSS class for each one of your pages. That way you don’t have to modify the wordpress files which you will lose on the next upgrade. 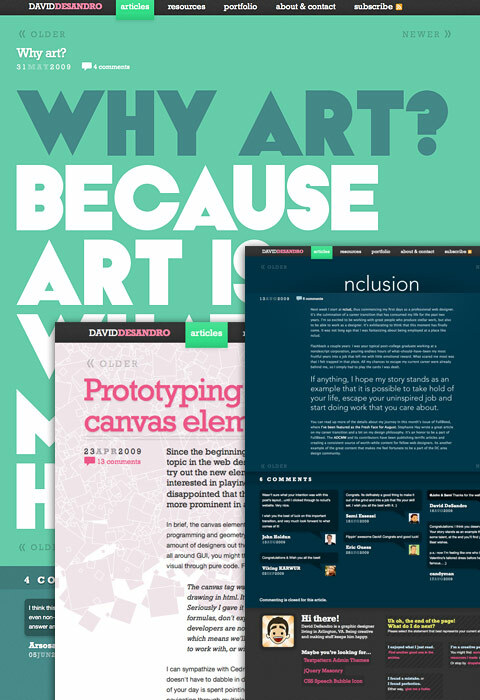 This post has some really good web design and wordpress examples. I think using a different theme for each post is a great way to catch people’s attention and keep them interested. 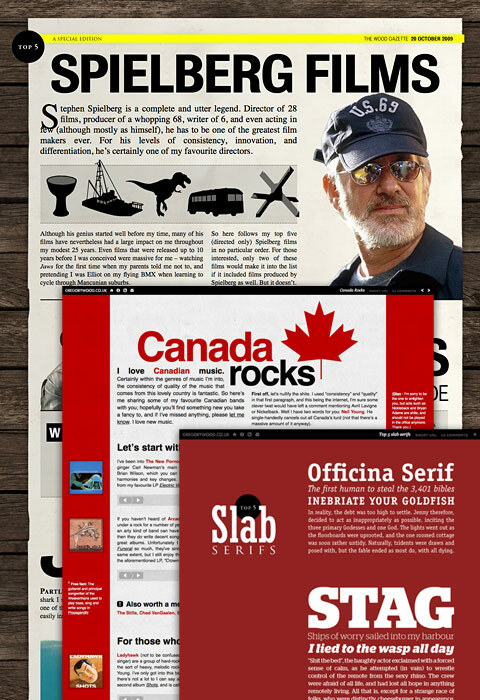 A few examples i like especially are the Paddy Donnelly, Trent Walton and I really like the typography used on David DeSandro’s blog. I do not think its wise to have a different design for every topic. Its a lot of work. A person should be spending time for back linking and SEO. To get traffic to the website. That to me is worth it. I agree with some of the other comments. I feel that subtle changes coinciding with the topic in hand is much better. Although I do think that the work shown above is pretty cool. Can see this for a magazine site like WIRED or something similar, but could get really confusing for the average web surfer. Most people browsing would get totally lost!!! We all get it because we’re designers. Some great designs though. Very awesome snippet, im sure going to use that somewhere! I would avoid using absolute urls in the custom fields. The blog’s url and the upload directory could change and therfore it should go into the php template snippet. More future-proof I think. I wanted to make a custom home page for a blog that looks like a website instead of a blog. Would this method work for that. That’s a lot of work but a very cool idea. well i am a great icon lover. and have collected more than thousands of the icons.really i will appreciate you for your very very decent and cool Efforts. keep it up. it will leave a very decent impression when added to collections. I love those designs; it’s great to see people and companies pushing the graphics side of web design. 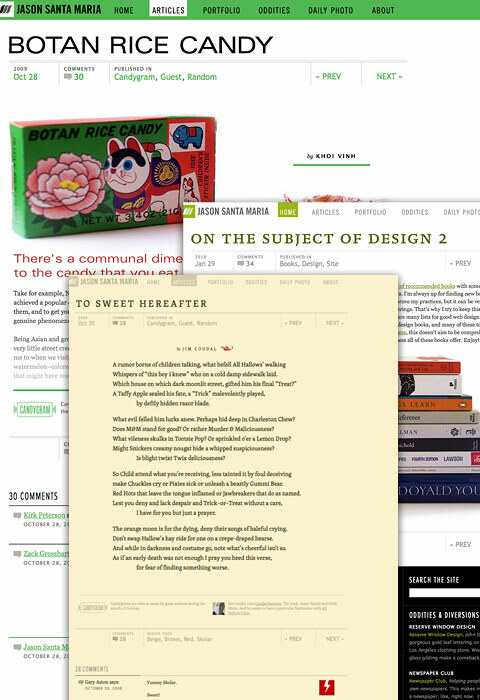 There are some lovely blog designs included here- real food for thought. None are as nice as Web Designer Wall though. How awesome is word press on a scale of 1 to 10? Friggin 100! As always you are #1 all others are #2 and lower. It takes lots of time to make custom designs but for some valuable content it’s worth it. Hi, thanks for this Web Designer Wall. I like the idea of individually designed post. I’ll bet that it could be a bit of work to accomplish it. Full time job I think. I love your showcase and the tips you’ve included too. I like how these sites keep strong branding between their posts, so you can tell it’s the same site – not that you’re on a new site. Great ideas for blogging design!! Every blogger has a different perspective and sense of style; so by creating a unique design it brings about a more personal page for the blogger and for the commenters on the blog. People will automatically be more attracted to a page that is more aesthetically appealing and thus have more probability to write on it. Also, as mentioned, it allows readers on the page to enjoy the little design details and brings forth a more pleasurable read. Also, because there is so much design implements on the bloggers site, it shows the readers that he/she put a lot of time and effort into it, the blog is important and thus is most probably checked often and there is an active exchange of conversation on given topics..
Great ideas for blogging design!! Every blogger has a different perspective and sense of style; so by creating a unique design it brings about a more personal page for the blogger and for the commenters on the blog. People will automatically be more attracted to a page that is more aesthetically appealing and thus have more probability to write on it. Also, as mentioned, it allows readers on the page to enjoy the little design details and brings forth a more pleasurable read. Also, because there is so much design implements on the bloggers site, it shows the readers that he/she put a lot of time and effort into it, the blog is important and thus is most probably checked often and there is an active exchange of conversation on given topics.. .
Great idea, but from a business blog perspective its too time consuming? Would definately be worth a crack at on personal blogs tho! Hey thanks for posting this! Very helpful, I’ve started to use php more and more, thanks! great home page i guess with a nice color..
all of the web design is so cool, great!! I like your comment. Your ideas sounds good! i shall get back you soon to get a bit of help. Mountainview Music Studio is all about learning music through playing the piano. Students are taught the traditional method of learning to read music, not names, lines and spaces, and rhythm. The instructor has a degree in music education and has taught public school music as well as private lessons for over twenty-five years. Her gentle, calm approach to teaching comes from a thorough knowledge of how children or adults learn best. Mountainview Music Studio is a full teaching environment with a Knabe grand piano for lessons, a Roland digital full keyboard spinet with prerecorded accompaniment tapes to play with to enhance rhythm and provide ensemble experience. Custom Web design and Development Company specializes in offering complete range of internet marketing & online solutions to improve your communications, sales, business efficiency, and customer satisfaction. I truly believe that this is the way the web should be going. If there is anyone out there saying that this is just a trend I would say that the same could be said about designing in templates. I kind of find the different blogs annoying, but that’s just me. This is the result of the hard work of creative people, I can only admire. Designing of any website is not an easy task and it requires lots of creativity.It is also time consuming task. 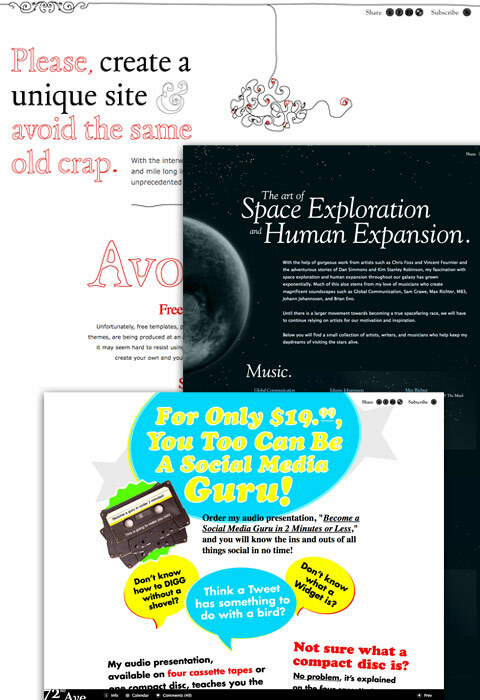 I must say, the blog post has very artistic layouts and the given wordpress tips are very useful. what about a custom content tags? I mean where the Content is going to appear as long with other stuff. because Css only is really useless. Informative and helpful information for new companies of web designer and web development. I’m a nubie blogger.. I’ll save this page..
outlet I have introduced a lot of friends look at this article, the content of the articles there will be a lot of attractive people to appreciate, I have to thank you for such an article. Thanks for the great post. I will use your tips to create unique posts on my wordpress website. this is great article and the web design is beautiful. This is a great post. Your site is really well done. Thanks for all the informative blog posts! The blog is full of information. I love to know the newer things all the time. Your provided tips are very helpful. Nice article, we really loved it. Do you mind sharing it on http://www.writetube.com? You can also consider submiting your articles, press releases and videos to this site as well. It is again one of the best and non-spam site. It accepts all non adult content. I’ve found this post very informative and your tips are very helpful. I am learning wordpress and I am gonna keep your tips on my mind all the time. Thanks a lot. Good posts on this web designing blog make me read this blog again and again i liked this blog very much This blog has got all the useful stuff that i wanted to know about. 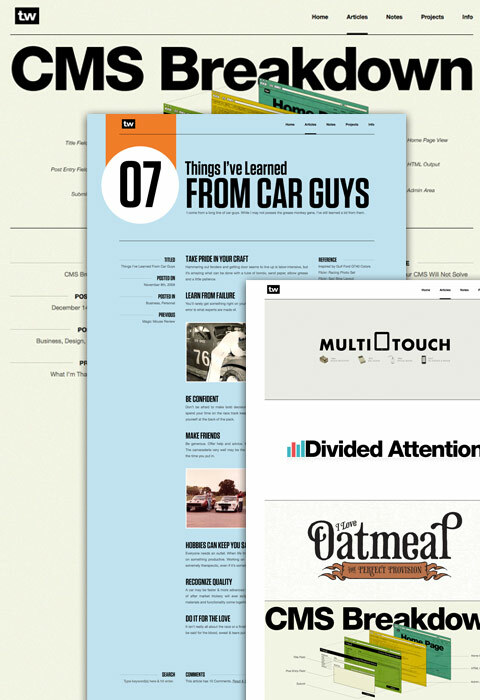 I like the look of the Web Designing Wall blog both the designing and their content is cool. Nice blog you got here. It really helps a lot on the info you are giving. I also created a blog similar to this one. You might wanna take a look at my blog http://www.phil-gabriel.com/ too. Please keep updating your posts. I will bookmark your page. I have introduced a lot of friends look at this article, the content of the articles there will be a lot of attractive people to appreciate, I have to thank you for such an article. Just beautiful. That is the way the web should be. Hats off to all of them. Suddenly i got this blog really interesting .I know all of guys are well developer . Cool, thanks for sharing will definitely bookmark this! Really great site. Your ”Trent Walton” topic is good. i read this topic. NHTE specializes in providing web design and development, Graphics design, Seo with excellent product to ensure 100% customer satisfaction at best price. Thank you so much for sharing these superb tips! I am so impressed of the designs and I complement the creativity behind these works. 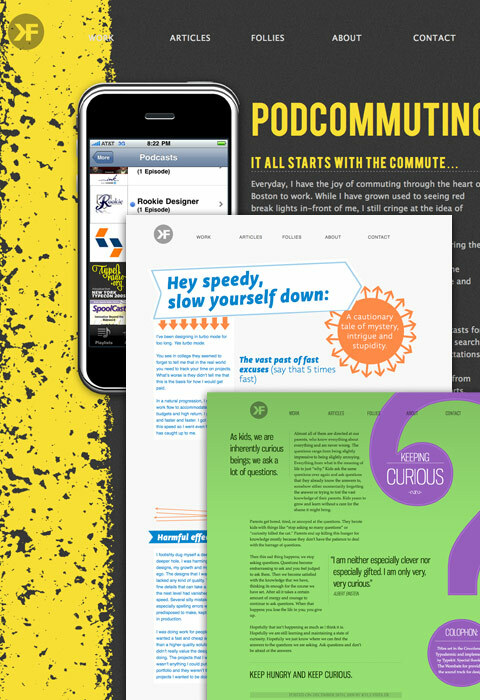 The designs are catchy and will surely get the user’s interest in reading the blog post.